This is an invaluable tool for me. Yes, it could have more words in it, but I love the fact that I can look up a verb in Italian, or Spanish and see how to properly conjugate that verb. I work in Italian, and consequently am learning Italian. I use this tool on a regular basis. It doesn’t have every word I need, but it is extremely useful. It is free (not even ads), give it a try. You will love it. Also in Preferences you can check the box to show paid version words… there are all those words I was looking for... I haven’t paid from them yet. I cannot think of a better way to give away your very resourceful dictionary for FREE and still make a living. I personally think it is a very nice app. I keep them on to remind me if I really need to, I can always buy the full app with more words. 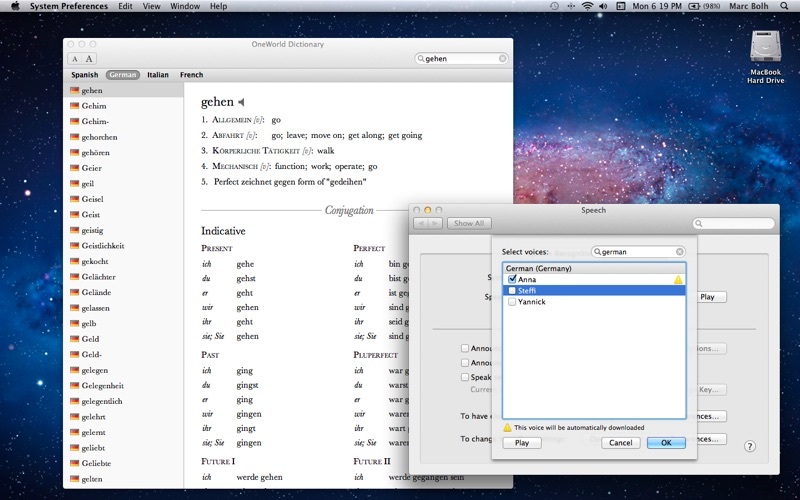 I needed a robust French-English dictionary to work offline, and the in-app French-English dictionary did just the trick. I would have been satisfied with just a complete dictionary, but this app went above and beyond and provided native speaker pronunciations to each word and a complete conjugation table for each verb, which has helped improve my French even more. 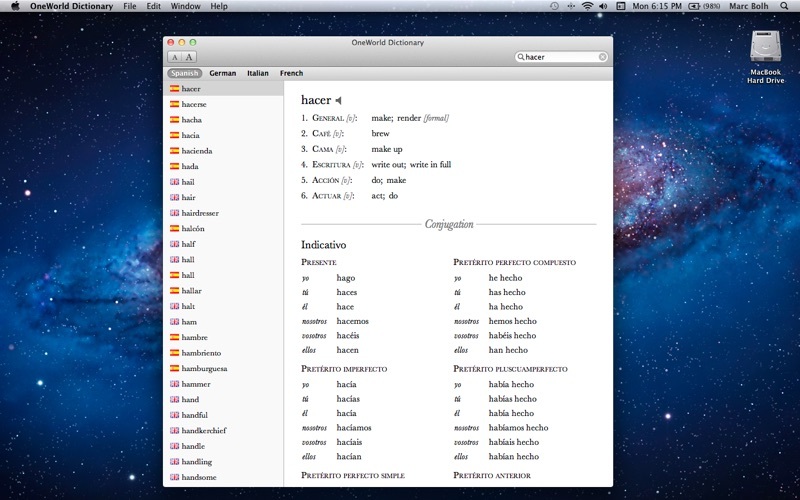 Overall the dictionary is very complete, runs smoothly, and ultimately was worth every penny. The app is great. I am just starting to learn german so its been very helpful. But the library is a bit lacking, on more than one ocassion, I came across words that I did not find on the app. I’m an aspiring linguist and therefore I download several dictionary apps all of the time! I can especially speak for french-engish languages when I say this app is okay. my main problem with it is its search facility does not take into account conjugated words. In other words, you must know the original form of a verb for instance, in order for the search engine to find it in details. It’s a great and conveniet app, but I find the Italian dictionary to be lacking, though I’m impressed with the French and Spanish. I use all three for my courses, as a quick and easy reference, but sometimes can’t find basic words or translations for Italian. Great for other languages, though! I have this dictionary on both my computer and my iPhone. I use it a lot since I am a beginning French speaker. But cross-links that take me to the french side from a definition on the english side would be very useful, especially for the verbs. That way when I want to find the french verb for "to come" I see that it is "venir". Now I have to search for "venir" to get the conjugation. A pain. It is not well thought out for the user in mind. Also, I have found many instances where a french word is given from the english side, but when I want to see the conjugation, I type it in and it is not on the french side. For instance search for french verbs for "to forget". You get "omettre". Now I want to see the conjugation of "omettre", only to find "omettre" is not in the french dictionary. I find this too often. I do like that the verb conjugations are given for the french verbs. I have not shopped around for other french english dictionary apps, so for now I am stuck wiht this one. I must say that I do use it a lot though. Great app. It would be worlds better if it didn’t keep asking me to rate it all the time. I'm disappointed. Sure, it's a dictionary. But it doesn't even give plurals of nouns. It has a lot of verb conjugations, I'll give it that. The definitions are just lacking. In order to get all the information I need I still have to refer to Ultralingua's dictionary on my iPhone. I expected FAR more from a Mac OSX application. 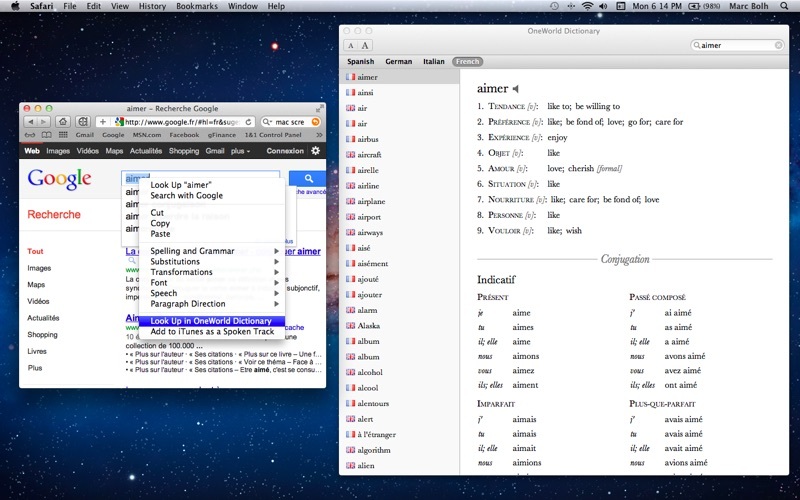 After spending $13, I guess I wanted a more full-featured dictionary. It does integrate with the German voice available as part of OS X, so it speaks the word to you in German, which is nice. I'd really like to have the ability to record my pronunciation of a word and then contrast that with the way it should be pronounced. Before that, I'd like to have better coverage of nouns. This is just OK - not great by any means. Love the product. Am in my fourth year French and the upgraded version has all I need for class and homework. Great customber support is also appreciated by this user.